Wrist and forearm splints are designed to immobilize and provide firm and comfortable support to the hand and wrist in various orthopedic conditions. 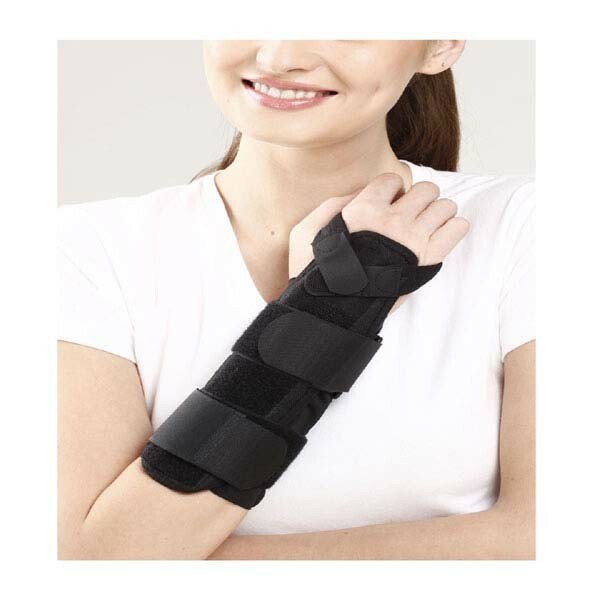 They maintain the wrist in the functional position.This splint from Tynor is made of PUF fused fabric that is breathable, and hence comfortable. It has removable aluminium splints that offer a customised fit and good grip. They also make it possible to achieve the required degree of dorsi-flexion. The long length of the brace ensures enhanced immobilisation. The brace also allows free finger movement. The hook loop closures ensure optimal compression, and make application and removal easy. It has a built-in opening for thumb abduction that offers better pain relief and ensures that the thumb remains relaxed.